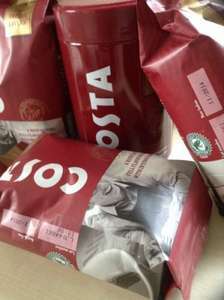 The Costa Coffee ground is around £3.50 for 200g in most supermarkets at the moment. Morrisons in Worthing West Sussex had it at £2.00 per 200g. I am not sure if it will be across all stores or not. I would think so! Also Spotted in Swansea - got some myself. If you like a proper strong cup of tea, they also have Thompson's Punjana @ £1.50 for 80. Not a stunning price, but better than the normal £1.99+. Also a little tip for the enviromental people among us........ if you have any coffee left over some plants will love what is left over.... Some plants that like acidic type soil so coffee is great. Poor it near the roots.. dilute with water will make it go further. Yes and apparently slugs hate coffee grounds, so a ring of your left over grounds around you veg seedlings might save them from being savaged. Though, for the same reasons as ptmill mentions you have to be careful not to over do it (a lot of vegetable plants do not like acidic soil). Whilst we're talking coffee and cafetieres, does anyone know a good method to get great tasting coffee using a cafetiere? I never quite get it right. Whilst we're talking coffee and cafetieres, does anyone know a good … Whilst we're talking coffee and cafetieres, does anyone know a good method to get great tasting coffee using a cafetiere? I never quite get it right. imo scrap the cafetiere and get a Aerobie AeroPress (or cheap filter machine if you drink a lot of coffee). Anyway to make a decent cup with a cafetiere the trick is not to use boiling water, either turn the kettle off just before it boils or leave it a minute or so after it boils before adding the water. It its the same grounds as I got for christmas its one tablespoon per cup/mug of coffee. Madferrit, boil twice the amount of water you need. Fill the cafetiere with boiling water and let it stand for a minute, pour that water away. Add your coffee, add the rest of your water which will now be a good temperature. Stir well, put the lid on but resist the urge to plunge. Wait 3 mins. Plunge, pour. Madferrit, boil twice the amount of water you need. Fill the cafetiere … Madferrit, boil twice the amount of water you need. Fill the cafetiere with boiling water and let it stand for a minute, pour that water away. Add your coffee, add the rest of your water which will now be a good temperature. Stir well, put the lid on but resist the urge to plunge. Wait 3 mins. Plunge, pour. Yes more or less my method but I never use a metal spoon to stir the cafetiere...I use a hard plastic spoon.....an old wives tale I guess but I get perfect coffee if of course using the quality blends...Costa is OK but I prefer the Taylors range that may still be 2 for a fiver in Asda....I may add...... always black coffee no sugar for me. This is also included in the Asda '2 for 5' Deal. Obviously not as cheap, but gives you access to other brands for 2.50 each. Your instructions sound similar to those which I've used in the past. I guess I've always struggled with getting the coffee quantity correct. My cafetiere comes with a large heaped spoon but that size seems more than a tea spoon/ possible a table spoon size. Hence the quantity has never been right. Can't wait to brew in the morning. I've been using 2 scoops of coffee (each scoop is equivalent to a rounded tablespoon i think) in my cafetiere for a large mug of coffee. Is that too much then? The instructions say 1 scoop for 1 'cup' but their cup size is very small i think. Mirroring what people have mentioned on using a cafetière. I used Taylor's guide, but about half the water shown in video, and swirl it more vigorously to reach nearer lid. Prior to that I diassemble plunger and rinse parts under tap if I didn't wash all of cafetière after previously use. I would also check how much water your cafetière holds by using a measuring jug and cold water. So you can gauge ratio of coffee to volume. I think the general gist is 'a bit of common sense and trial and error = good coffee'. It's not an exact science and each coffee and persons personal tastes will vary. For people looking for the tin which is currently £4.19 -£4.90 depending on shop.... Sainsburys you can get a tin (250g) Save 33% was £4.19 now £2.79 I have put this under another seperate offer. I am not sure if I can link to it here as I am fairly new to this! Deal posting newbie! This is ptmill first deal post. Help out by leaving a posting tip or just to show your appreciation for their contribution.